This particular Horse Driving Bit is made of polished metal and will provide maximum durability even when used on a daily basis. Rest assured you are getting only superior quality horse bits here at Horse Tack Now. The Fancy Liverpool Snaffle Mouth Driving Bit is one of the most popular driving bits. This item is made of pure solid stainless steel. 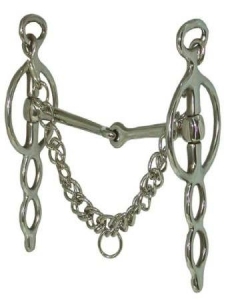 Only the best snaffle mouth driving bits are sold at HorseTackNow at discount prices. View the image above and see the high quality of this bit. The polished stainless steel makes this an even more luxurious product.